Where have I been? Not cooking, that’s for sure. Too much going on, one of which is cheering for the Cross Athletic Lady Knights from North Georgia playing in the South Carolina State Open Tournament for Homeshoolers. Our JV Girls’ team won!! Woohoo. This was the end of their first season making a record of 19 wins and 6 loses! Not too bad, huh? From a small Mississippi town and have lived my adult life in the south. I am the wife of Tom Irby since 1974, mother of 8, grandmother of 8, lover of Truth, previous owner of The Baron York Tea Room Cafe and Gift Shop (7 years), cookbook writer, moderator of the Small Business forum on Social Media Examiner, enjoy life and all the adventure God brings my way. 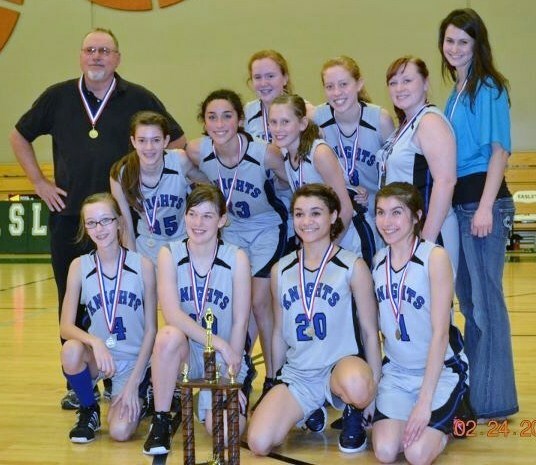 This entry was posted in Journal Entry and tagged basketball, champions, Cross Athletics Knights, girls' basketball, homeschool, journal entry, South Carolina. Bookmark the permalink.